The Outwell Hartford XL consists one large dome area with three standing height bedrooms off it. This height is achieved through Outwell’s Extended Frame (OEF) system which also offers strength and lightness. We like the ability to stand up in your own bedroom area, as this makes organising things / tidying up a lot easier on the old knees. We also like the option of being able to customise the bedrooms for your children by buying a kids room inner section (optional extra around £45). This extra allows then to store their toys in pockets so your not tramping on them when tiding up. The large dome area offers a huge space to eat, cook, wash up etc but if you feel this is not big enough then you may want to consider buying the Outwell Hartford XL front extension. (~£75). 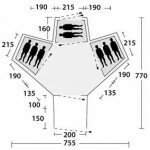 This extension turns the large Outwell into a huge tent, with numerous uses and really the more you can cover your options,so to speak, in respect of inside space the better. Lets see what’s under the hood of the Outwell Hartford XL tent. The fabric of the tent is made from fire retardant material and the outer layer has a hydrostatic head of 3000mm. Hydrostatic head is a guide to how waterproof the tent is. In the UK anything above 1000mm is considered waterproof. However, the higher the number is the more it will withstand driving rain, an unfortunate common occurrence in the UK. There is obviously no point in stopping the water from getting in if the fabric stops the moisture from leaving the tent so Outwell have made the inner tent breathable which along with good ventilation between the outer and inner ensures that condensation build up is kept to a minimum. The Outwell Hartford XL tent is pitched flysheet first which has the benefit that the inner is kept dry should you be unlucky to pitch your tent in the rain. The groundsheet is sewn in and is made from double-coated polyethylene (optional extra) which is strong and durable but can be additionally protected by using the Harftford footprint. The footprint protects the ground sheet from scuffs from small stones and rough ground whilst also keeping it clean. The tent itself weighs 20.9kg add to that the poles (11kg) and the overall weight comes to 31.9kg . The Outwell Hartford XL tent is ideal for family camping, perhaps not weekend camping due to the length of time it takes to pitch but certainly good for week long breaks and longer. The ventilation and waterproofness should keep your family dry in the worst the British weather throws at the tent. 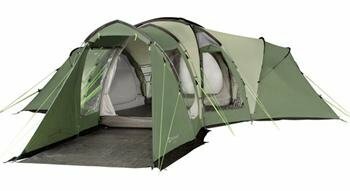 From time to time Tents Camping receives promotional codes, voucher codes and discount codes directly from the retailer. Our aim is to ensure that you get the best deal for your tent or camping equipment, so if you know of any retailer which is offering great value for money then just drop us a line or post a comment below.